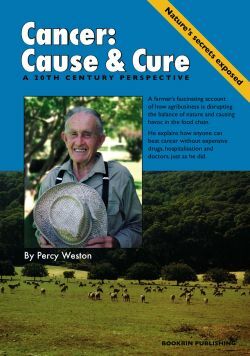 I picked up a copy of the book “Cancer: Cause and Cure – a 20th Century Perspective” by Percy Weston a couple of weeks ago. I found Percy’s story so intriguing that I had finished the whole book within 24 hours… I just couldn’t put it down. An Australian farmer born in 1903, Percy saw the transition from traditional farming methods to modern methods of adding phosphate fertilisers to soils and toxic pesticides to crops. Finding that all his sheep had cancerous growths after introducing superphosphate fertilisers, Percy used his training in chemistry to find an alkalising mix of minerals that would bind to and remove the phosphate the sheep had ingested. He repeatedly showed that adding phosphate to his soil saw his sheep develop cancer, and that introducing other minerals into their diet cured his sheep of cancer. So when both Percy and his wife developed cancer, they ingested the same mix, with the same results: their cancers were cured. Percy went on to live to the ripe old age of 100. Percy’s logic makes perfect sense, and his theory could easily be tested in a laboratory if any of the “cancer research” institutes were genuinely interested in curing cancer… He first made his discovery in he 1940s, and worked tirelessly trying to get anyone in the medical world to listen to him. There aren’t a lot of books that really excite me, but this is one of them. While I had read elsewhere about how alkalising can effectively cure cancer as cancer cannot survive in an alkaline environment, and Percy’s alkaline mix of minerals would logically have the same effect for the same reason, I had not come across his specific link with the introduction of phosphate as a specific cause and I found that fascinating. His explanation is so clear and scientifically sound, that I would challenge anyone reading his story not to reach the same conclusion Percy did. I found that Percy’s account helped me understand even more the importance of eating organic food and maintaining an alkaline lifestyle, and it has motivated me to ensure I supplement my diet regularly with alkalising minerals as well as being stricter with sourcing organic fruit and vegetables.